Iowa Fertilizer Company (IFCo) is a wholly owned subsidiary of the Netherlands-based company, OCI NV, a global leader in nitrogen fertilizer production and an engineering and construction contractor. OCI NV has an international fertilizer distribution platform spanning from the Americas to Asia. IFCo is located in Southeast Iowa and near the western boundary of Illinois. Construction of IFCo's $1.8 billion plant began in March 2013. By late 2015, the new plant will begin producing between 1.5 and 2 million tons of nitrogen fertilizer each year. 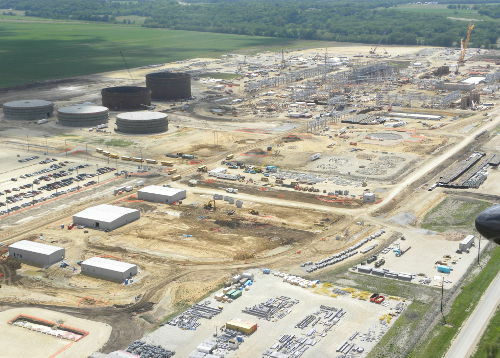 IFCo will be the first world-scale fertilizer plant built in the United States in nearly 25 years. Nitrogen fertilizer accounts for about 60 percent of global fertilizer use. The output of the IFCo plant will drastically reduce US dependence on imported fertilizer. In addition, a domestic fertilizer source will save farmers across the country millions of dollars annually. IFCo chose Yokogawa as the Operator Training Simulator (OTS) vendor for its IFCo complex due to Yokogawa's proven capability with OTS in the fertilizer industry and track record in integrating Yokogawa's OTS seamlessly with CENTUM VP Distributed Control System (DCS) and ProSafe-RS Safety Instrumented System (SIS). CENTUM VP, ProSafe-RS and OmegaLand were used for the development of the OTS for IFCo. Yokogawa's simulator offers a highly accurate operator training system with a realistic feel, an environment for examining and verifying control methods, functions for plant optimization, energy saving designs, and online operation support through the use of modeling and simulation technologies. The IFCo OTS implementation is being carried out in the ammonia, urea, and nitric acid units. Yokogawa provided support by designing, developing, implementing, and testing the OTS in the processing units. The main objective of the OTS implementation was to enable training for unskilled operators and start the plant flawlessly and safely, without any incidents. Understanding the importance of the OTS and adequate training, the project was dedicated to Yokogawa by the IFCo operations management. The original scope of the modeling was medium-fidelity, having the capability to train only board operators, and with a single license of OmegaLand to allow one unit of operators to be trained at a time. After noticing the capabilities of the OTS, the customer increased the scope of modeling to allow for training of field operators, and also increased the license capabilities for two OmegaLand licenses and train two units of operators at the same time. One major challenge of the OTS implementation project was the three-month delay in receiving the post FAT DCS/SIS database. The quality of the DCS/SIS database was below the expected level to perform start-up of the unit due to lack of inputs provided by the EPC to develop the simulator system. Yokogawa took great initiatives to meet the project schedule by correcting the DCS/SIS database and allowing proper and timely training of the operators. IFCo was able to start training their unskilled operators on time despite the initial delay of the plant commissioning. The operators were trained and prepared for the actual plant start-up and subsequently able to reduce start-up time by identifying the control system issues in advance. A major benefit observed with the OTS implementation project was the ability of IFCo's customers to identify flaws and issues on the DCS/SIS database eight months ahead of schedule. These issues would have otherwise been identified during actual commissioning, delaying the start-up of the plant. "The first week of OTS training on the nitric acid plant was a great success. All nitric acid operators attended the basic OTS training and they were all very enthusiastic. The model works fine and we, as trainers, are satisfied with the result of the first week. There is still a long way to go, but I am convinced that the OTS is a valuable training tool for the greenfield operators while not having an actual plant." "The Iowa Fertilizer Company would like to recognize all the hard work and continuous efforts of the Yokogawa team to get an OTS system ready for use at IFCo. We want to especially commend the dedicated time given by the Yokogawa team to get the system to a point where our IFCo team can test as it is being engineered. Also, IFCo commends the Yokogawa team for implementing an enormous amount of DCS-ESD (Emergency Shutdown) items that were not in the initial scope of the project, but were made to IFCo's specifications. This will help IFCo continue making forward progress to fulfill the mission effectively. It has also allowed DCS-ESD designers to review and change all of the findings discovered through the OTS, leading to an important saving of time on the future DCS-ESD SAT tasks to be performed." "After a month of training on the Nitric Acid OTS, we can conclude that OTS contributes to a higher knowledge level (theoretical as well as practical) of all the participating operators. This applies to the field operator as well as the board operator. While talking with the operators, they tell us that the training on the OTS ensured that 'the pieces of the puzzle fell into place.' In combination with the theoretical knowledge that they gained while attending classes, reading operator manuals and the usage of the OTS, they have a more complete overview of the plant and processes within that plant. There is still a lot of work to do, but the OTS is a perfect training tool for operators who have no experience in chemical plants at all, as well as people who have that knowledge."